Just checked with Brian Gavin Diamonds (affiliate link) that they indeed revised their prices for smaller carat weight (0.18ct - 0.99ct) as they have a new diamond cutting facility as well as due to economy of scale. This is also done do reflect the current market condition. 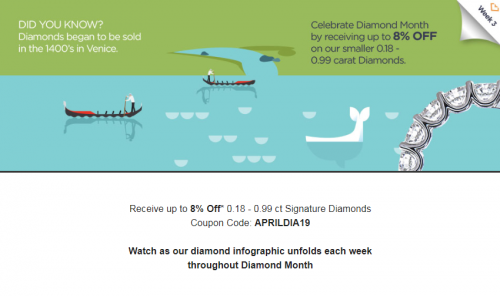 To add on, for those diamonds that do not make it into their Black category (affiliate link), you can enjoy 8% off (including 3% wire discount) currently by using the discount code APRILDIA19. You can rest assured that those that do no make it into Black does not mean that they are bad diamonds, the difference is actually subtle and they are able to stand strong against any typical virtual inventory diamonds in the mass market. Shipping is not free, but try to ask for it nicely. You could possibly get it, but no promises. Loose diamond import is also tax-free in Malaysia, so you only pay the amount stated on their website and that's it. @kambingkoh any KL diamond stores you can recommend for best value and quality? If you want slightly more luxury feel with a reasonable price, then ZCOVA is a good choice. Their supplier is really extensive, you will be surprised. What you see on their website is rather limited. I will usually tell people to look at BlueNile, look for anything they like, and check with ZCOVA. As long as it is virtual inventory, then they are highly likely to be able to source it. You can also check on Enchanted Diamonds as well, I have a forumer that has successfully price matched a stone with ZCOVA. They are run by young people with modern thinking so it is quite easy to talk to. Tailored Jewel is also another good choice. Their prices for smaller diamonds are very competitive, so the larger carats may be the same. I don't think their suppliers are as extensive as ZCOVA though. However, their boss Ethon is extremely good and trustworthy. iDo Jewellery is another good choice too. She has been in this industry for some time and gain quite a reputation. Her ring designs are nice. You can try Memory Jewellery also but their supplier is very very limited as far as I know. They have some very good diamonds for smaller carat size, but since your requirement is like 1.38ct, it will be harder. They are a lot more... Like The Gem Tribe at Cheras, Eumayco at Bangsar South, Audrey's at Shangri-la, Pointers at Subang, etc. But if you want the best of the best in terms of proportions and workmanship, you have to go with true Hearts and Arrows with tight proportions. 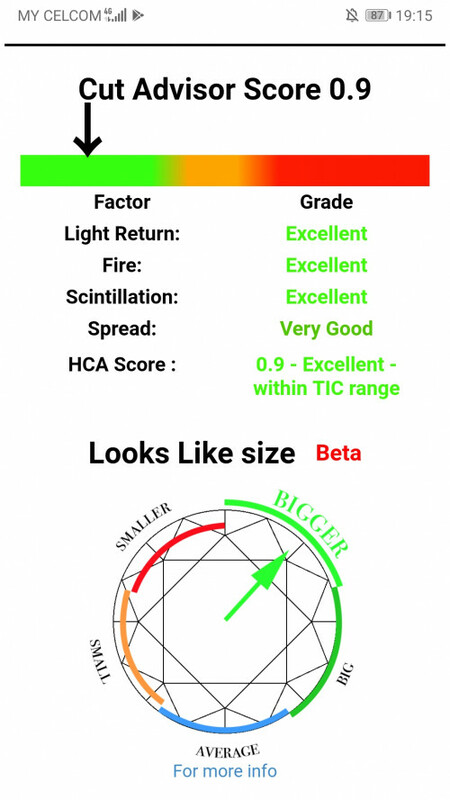 If you prefer GIA grading report for some reason, the closet place you can get is from JannPaul in SG. I have seen a lot of people that is satisfied with their diamonds. Do note these sort of diamonds are typically more expensive than than those diamonds from the KL jewellers I mentioned above, but you do get a set of extensive proof of performance and data for them. Nice. This is certainly worth to consider IMO. The stone I browse is Type2a, I think is the rarest kind of diamond or maybe one of the rarest if they are actually mined from earth. I believe only lab can tell which is which. And personally I don't think the differences that can be detected by labs will show any differences in real life. Do update if you eventually do get something from them. Now that I am taking a closer look, I take back my comment on the price. While the price might not be all that much different at smaller carats, the scaling of the price is much less steep as the diamond gets bigger. 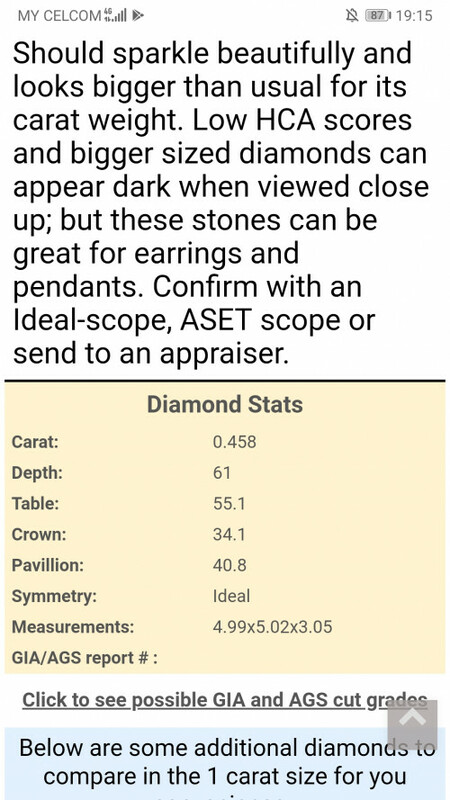 So, the price difference is actually very significant when looking at larger stones. I don't think lab grown ones can hold much value (as in for reselling) but given it's no different from mined ones, I think they would do for personal use. After all, if the difference is only on lab testing equipment and not to the naked eye, seems like quite a bit of savings there. I can tell you now there is no difference if cut quality is the same. Lol. No la, not planning to get any lab grown anytime soon, more interested in diamond stimulant like Amora more. Sparkles better than real diamond as it has higher refractive index I think. And diamonds do not have any resell value, natural or not. The only company that can provide you lifetime 80% buy back value is probably High Performance Diamonds. Probably the only one in the whole world. And yes, as it scales up, you will find it much more affordable. The market is getting bigger for lab grown as far as I know. I believe they are here to stay. What worries some jewellers is that melee diamonds have no lab report, so when they purchase melee diamonds in high volume, some lab grown diamonds might be mixed into the parcel and being treated as the real deal. I have tried and got below..
Hi, sifus. Need advice to buy proposal ring for my girl friend. been looking through Zcova dan Audrey website but have no idea where to start and which to pick. prefer 0.3 carat diamond budget around RM3.5k. I would prefer buying it online. thanks for the help. can you guys help to comment on this diamond? RM4.25k inclusive of setting. Hello~ Where can we purchase unique ring box?